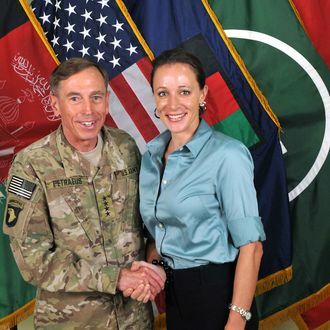 Both Broadwell and Petraeus denied that he passed her classified information, and a second official says there’s still no evidence that suggests the general was her source. The official said that over the summer agents were mainly focused on determining if the CIA director’s “e-mail had been hacked, he was in danger, or he was compromised.” The investigation by the cybercrime unit of the Tampa FBI field office “is now about the source of documents on her computer.” An official described it as a “clean-up effort” to make sure there’s nothing they overlooked. As for the complaint that sparked the scandal, The Wall Street Journal reports that Jill Kelley, the Tampa socialite at the center of Petraeus’s Pentagon of Love, tried to call off the investigation over the summer when she became concerned that agents were privy to too much personal information, and the case would ultimately be more trouble than it was worth. Obviously her instincts were right, as the media is now camped outside her home, and both she and Broadwell are the subject of creepy news photographs snapped when they stood near a window. The Fox affiliate in Tampa reports that Kelley has called police four times in the last two days to complain about the gawkers surrounding her home, but that didn’t do much good either, as the 911 calls were released to the media. Kelley suggested in one call that as an honorary consul general, she has “inviolability.” “So they should not be able to cross my property,” she said. “I don’t know if you want to get diplomatic protection involved as well.” Unfortunately for Kelley, like an honorary doctorate, her title does not grant her any diplomatic privileges. Did Paula Broadwell Divulge Classified Information?